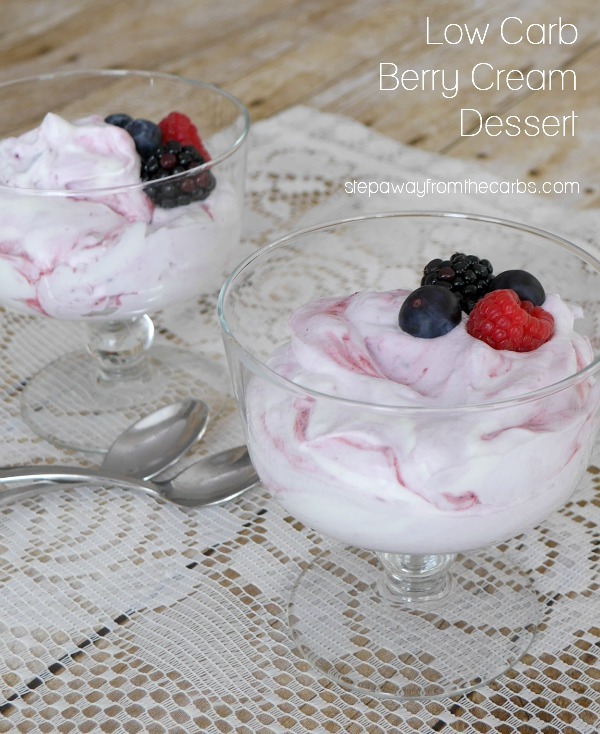 This berry cream dessert is a wonderfully fruity low carb treat. LCHF, keto, and sugar free recipe. For this recipe I’ve use three kinds of berries: blueberries, blackberries, and raspberries. I like the combination – both visually and the flavor – but this recipe would work just as well with only one or two kinds. 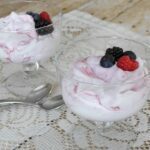 This dish is really a kind of “fool” – an old English dish made with whipped cream mixed with stewed fruit. But whatever you want to call it, it’s a dessert that everyone will enjoy! 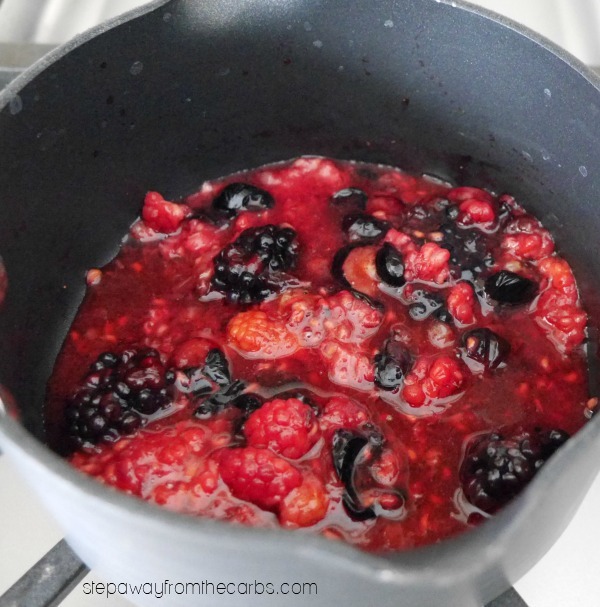 To make the berry sauce, add the fruit to a small saucepan with a splash of water. Heat over a low-medium heat until the fruit starts to break down. Leave to cool. Whip some heavy cream with a little low carb powdered sweetener (I use Swerve), until soft peaks have formed. I place the whisk attachment for my stand mixer in the freezer for 30 minutes before whipping cream it makes a great difference to the volume of the final result! Gently fold the cooled berry sauce into the cream – it doesn’t have to be fully mixed in. Spoon the cream into serving dishes, bowls, or glasses, then garnish with a few extra berries. Enjoy! Whip some heavy cream with the low carb powdered sweetener (I use Swerve), until soft peaks have formed. 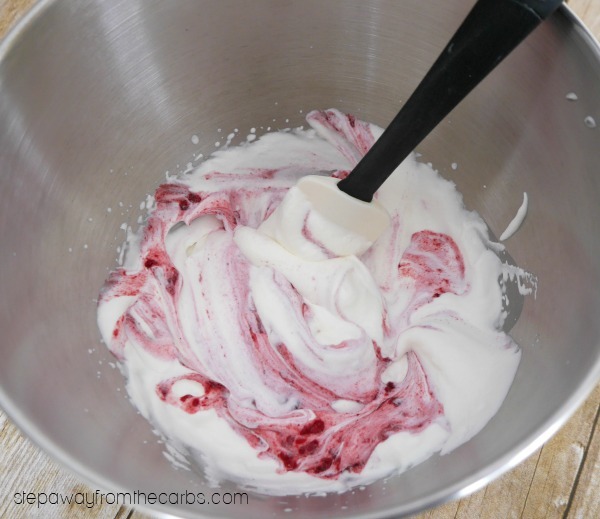 Gently fold the cooled berry sauce into the cream - it doesn't have to be fully mixed in. Spoon the cream into serving dishes, bowls, or glasses, then garnish with a few extra berries. 6g net carbs per serving NOT including sugar alcohols from the sweetener.